The church of St. John the Baptist at Mathon was built at the end of the 11th century, and was extremely basic with little furnishings. During the late 14th century, a large tower was built – mainly for housing the six bells, (seven were mentioned later) but like many towers it was also used as a place of safety for the villagers when a raid was expected. In the middle of the 19th century, the church was in a somewhat dilapidated state. The Rev. A.G. Douglas took over the living, and found that the church was in a shocking state, and the floor was covered with bits of brick and slate. He set about restoring the church, making many personal sacrifices to achieve his aims; the parish was so sparsely populated that little help could reasonably be expected from the villagers. However, the Rev. Douglas never gave up and although it took 15 years he achieved his aims – the parishioners did everything they could to help raise funds along the way, and did an amazing job considering how few of them there were. Much of the work though was down to the Vicar and his family, and Miss Vale of Mathon Court. “A beautifully restored church now invites the parishioners to worship – such a one as we would wish to see in every parish throughout the diocese – indeed throughout the world. It consists of a nave and chancel, with tower at the east end and open to the nave, the church being built of rubble masonry. The nave has been denuded of its layers of plaster and whitewash, and the stone work cleaned down and repointed. The chancel has been entirely rebuilt and the old Norman windows reinserted and filled with stained glass. 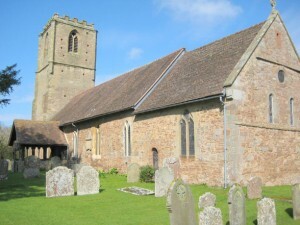 The roof has been stripped ; the old stone slabs removed and replaced by new Broseley tiles, finished with ornamental cress; stone coping being used throughout, and a new stone cross and the elegant old wooden one 0 although slightly disfigured – placed over the gables of the nave and chancel respectively. The description carried on in great detail, all of it lavish in its praise. There is an oak chest bound with iron straps and made to hold the parish records. Its bears the names on the lid of the churchwardens, Jo. How, gent, and H. Dangerfield 1698.